Edgar Schein is Sloan Professor of Management Emeritus at the Sloan School of Management at the MIT. With this book, Organization Culture and Leadership (4th Edition), the author has published a summary of his life long experience (born in 1928, PhD in Harvard of Social Psychology in 1952) of organizations. It aims at explaining what culture is, how it affects the organization, how to understand and decipher it and how to act on it with culture change. And it does succeed, providing excellent material, shedding direct light to one of the most misunderstood dimension of organizations. A pattern of shared basic assumptions learned by a group as it solved its problems of external adaptation and internal integration (…) A product of joint learning. According to Schein, there are 4 categories of culture : Macrocultures (nations, occupations that exists globally, …), Organizational Cultures, subcultures (groups within organizations, and microcultures (microsystems with or within organizations). Schein identifies 3 levels of culture : artifacts (visible), espoused beliefs and values (may appear through surveys) and basic underlying assumptions (unconscious taken for granted beliefs and values : these are not visible). The latest being the more important since as Schein puts it “Human minds needs cognitive stability and any challenge of a basic assumption will release anxiety and defensiveness”. Many change programs fails for that very reason. According to the Emeritus professor, Leadership is the source of the beliefs and values and the most central issue for leaders is to understand the deeper levels of a culture (…) and to deal with the anxiety that is unleashed when those assumptions are challenged. Check out this great diagram by Chad Renando describing these levels and corresponding assumptions in a telling post. Inside organizations, there may be different subcultures. Schein identifies three of them : operator‘s (based on human interaction, high levels of communication, trust and teamwork), engineers (elegant solution, abstract solutions to problems, automation and systems) and executives (financial focus, lone hero, sense of rightness and omniscience). 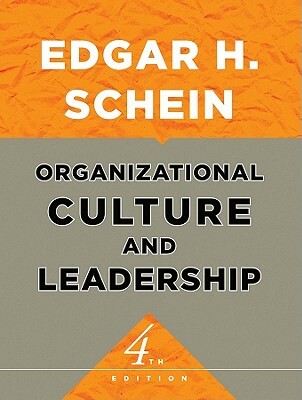 Schein is adamant that in any organization, the alignment between these three subcultures is critical : Many problems that are attributed to bureaucracy, environmental factors or personality conflicts among managers are in fact the result of the lack of alignment between these subcultures. This are the core problems groups and organizations are faced with : survival in and adaptation to the external environment and integration of the internal processes to ensure the capacity to continue to survive and adapt. For long range growth, the author shows that the key is to keep the needs of the major stakeholders of the organization : investors, suppliers, managers and employees, the community and government and the customers. 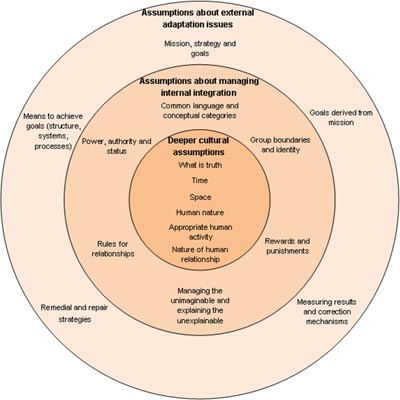 For external adaptation, the main challenge companies face is to obtain a shared understanding and consensus on 1/Mission and Strategy, 2/Goals, 3/Means, 4/Measurement and 5/ Correction (repair strategies). For internal integration the main problems according to the author are : 1/ Creating a common language, 2/ Defining group boundaries and criteria for inclusion and exclusion 3/ Distributing power authority and status 4/ Developing norms of trust, intimacy, friendship and love 5/ defining awards and punishment and 6/ explaining the unexplainable. All groups develop norms around these categories and if these norms get external tasks done while leaving the group reasonably free of anxiety, the norms become critical genetic elements of the culture DNA. All kinds of society are based on deeper assumptions on general abstract issues.This is how people relates to reality and truth, time and space, human nature and how people should relate to each other. Reaching consensus for instance is a process of building a shared social reality. There are many different criteria for determining truth, from belief and morality (pure dogma and right / wrong dichotomy) to pragmatism (scientific method). This does not only relate to how truth is defined but also to uncertainty avoidance (refer to Geert Hoftede Work). The ability to embrace uncertainty is a genuine advantage as, how Schein puts it, Organizational Cultures that can embrace uncertainty more easily will be inherently more adaptive. A key advantage in today’s economy. This is the second axis along which the structure of a culture is built. Anthropologists have noted that every culture make assumption about time. Schein identifies three types of organization depending on their time orientation : past, present and future. Hofstede again has found that economic development was correlated with a future orientation. A second dimension for how we relate to time is the notion of monochronic and polychronic. Monochronic is a view of linear time that ca be split, wasted, spent etc … This is typical of the western rational cultures. Some culture in Southern Europe or Middle East view time as polychronic, a kind of medium defined more by what is accomplished than by a clock, within which several things can be done simultaneously. In polychronic cultures, relationships are viewed as more important than short-run efficiency and may leave monochronic managers frustrated and impatient. Besides, there may be different relation to time depending on the organisation subcultures. For instance, operators time frame is the present, while Engineering subculture (R&D) has a much longer and different time horizon. Space has both a physical and a social meaning and feeling about distance have biological roots. This ends up in different levels of distance (intimacy, personal, social, public) whose length may differ depending on the culture. Also space includes a symbolic value through different allocations (executives at the top of the building, managers with dedicated office etc …). This is one of the reason why the introduction of new communication technologies (email, collaborative spaces, social networks) causes anxiety : it forces to the surface assumptions that have been taken for granted in terms of relation to space. This set of issues and dimensions reviewed constitute a kind of grid against which to map a given organizational culture. Douglas Mc Gregor has a well-known framework on this subject known as Theory X (managers believe people are lazy and must be motivated and controlled) and Theory Y (people are basically self-motivated and need to be channelled and challenged). The latter assume it is possible to design organizations that enable employee needs to be congruent with organizational needs. This is the dimension of organizations seeking to grow and to dominate their market. A second useful framework is the one about orientation. There is the Doing orientation whereby nature can be controlled and manipulated, there is a pragmatic orientation toward the nature of reality and a belief in human perfectibility. On the other hand, the Being orientation where nature is powerful and human is subservient to it, an orientation that implies fatalism and enjoying what we have, here and now. This is the orientation of organizations looking for a niche, trying to adapt to external realities rather than creating markets. In between both there is the Being-In-Becoming organization where the focus is on development rather than on a static condition. It is more on what the person is and can become rather than what the person can accomplish. This human related dimension is critical in making the organization safe for all. Typologies are abstract construct that are derived from factor analyzing perceptual data. These construct help in providing some order out of observed phenomena and predicting some new phenomena that may arise. These are abstract and therefore do not reflect adequately the reality. Yet they help in comparing different organizations. Gathering data on an organization can be achieved by asking employees how they perceive their organisation in terms of purpose, strategy or mission. There are different types of organizations : coercive (prisons, military camp …), utilitarians (private companies), and normative (political parties, non profit …). Some type of organizations fit the culture and in Asian or Latin countries for instance, Business cannot be effective unless they are coercive. Another axis of culture typology is the variation of authority. It can range either be : autocratic, paternalistic, consultative, participative, delegative and abdicative. The search for the universally correct leadership is doomed to failure because of cultural variation, organization history and the actual task to be performed. There are four types of organisation depending on their orientation : power (autocratic founders), achievement (results), roles (bureaucracies) and support. Another typologie can be carried out along 2 dimensions : solidarity (like-minded) and sociability (friendly). Low on both is Fragmented, High on solidarity alone is Mercenary, High on Sociability alone is Communal and High on both is Networked. Cultures basically spring from three sources : 1/ beliefs, values and assumptions of founders 2/learning experience of group members and 3/new beliefs brought in by new members/leaders. The first one is by far the most important. Leadership is highly sought by group members to reduce the group’s anxiety. Again, if the way to do things allow to get task completed while keeping group anxiety at a low level, this will become organizational culture. But if the environment changes and those assumptions become dysfunctional, the organization must find a way to change its culture. This is the role of the leader as John Kotter reported in his book What Leaders Do. There are embedding mechanisms a leader defines that will define the culture. What leaders measures, how he reacts to critical incidents, how he allocates resources, how he allocates rewards and status, how he recruits, promotes and excommuniates. Then there are the structural mechanisms (organization structure, procedures, rituals, physical spaces, stories, statements. Through the way leaders handle these mechanisms (embedded and structural) they communicate both explicitly and implicitly on their assumptions. If they are conflicted, these conflicts become part of the culture. Figure out from the above the deeper assumptions that determine the observed behavior. However, deciphering a culture requires the analyst to understand the potential consequences of an investigation and clearly communicates this to executives : the members of the organization may not want to know or may not be able to handle the insights into their own culture. obtaining leadership commitment : leader should also emphasizes that openness and candor are needed and that culture is not good or bad). identify shared underlying assumptions (do the espoused values explain the artifacts or is there anything more ?) – this is the most important step : once assumptions are made conscious, it triggers a whole new set of insights and begins to make sense of things that weren’t making any sense before. identify cultural aids or hindrance (within artifacts, values and assumptions which are the ones that help / hinder the goal). It is much easier to draw on the strengths of the culture than to overcome the constraints by changing the culture. Edgar Schein proposes a conceptual model for culture change (chapter 17). The most important takeaway is this : change creates learning anxiety (leaving what we know to something we don’t). This learning anxiety can be fueled by any of the following (valid) reasons : fear of loss of power/position, fear of temporary incompetence, fear of subsequent punishment, fear of loss of personal identity and fear of loss of group membership. The higher the learning anxiety, the stronger the resistance and the defensiveness. Change agents must draw on Survival Anxiety (what will happen if we don’t do anything) to unfreeze the situation and make sure that Survival Anxiety is greater than Learning Anxiety. This is similar to the Burning Platform of Darryl Conner or the Sense of Urgency of John Kotter. In order to achieve this, it is strongly recommended to lower Learning Anxiety in a view to create psychological safety, doing the following : communicating a compelling vision, formal training, involvement of the learner, informal training of groups, practice fields coaches and feedback, positive role model, support groups in which learning problems are discussed and consistent systems and structures with the new way of thinking and working. The only way to overcome resistance is to reduce the learning anxiety by making the learner feel “psychologically safe”. The change goal must be defined concretely in terms of the specific problem you are trying to fix, not as culture change. The change may not be possible without cognitive redefinition whereby people will have to unlearn the former way of working to learn the new one. This unlearning period is psychologically painful. These new cultural elements can only be learned if the new behavior leads to success and satisfaction. This is a wonderful book moulded with wisdom and experience and it provides unvaluable scientific hindsight to something we generally are quite uncomfortable and clumsy with. No doubt #hypertextual will relentlessly come back to it. Hi Jon, Happy new year my friend ! A great summary – well done. But I still prefer his short, accessible book: “Helping”, which in a way for me is the key to the door of “Organisational culture and leadership”. Hi Peter, thank you very much for your kind comment. I’ll check out Helping – thanks for the recommendation. Culture is key to so many organisational change initiatives, and is often overlooked as a factor. Hi Chad – thanks for sharing your article in the first place. loved the diagram. Hi Krishna, thanks for your comment. Pingback: Cultural Artifacts, Commitment, and Behavior in the Workplace | Amy Bucher, Ph.D.
Pingback: What That Sign Says About Your Corporate Culture | Amy Bucher, Ph.D.
Pingback: Does Your Office Have a Problem with Passive Leadership? Hi Cecil – I wanted to source you for a paper I am writing…how would I do that 🙂 are you wiling to share your last name? HI Sheri – OK to share my last name, thanks for asking. Hi Sheri – Did Cecil ever provide you his last name? I wish to know for my academic paper as well. Hi, this is very informational. this is a great help for someone doing some paper like me. I’d like to ask your permission so i may use and cite this as one of my sources. Please let me know how can i properly cite this article. thank you. Hi Claire, you certainly can. You may refer to it as “#hypertextual blog article – Edgar Schein : Organizational Culture and Leaders”. Thanks !